At MACNA last year, Ecoxotic had a rather beefy Photon Cannon sitting in an obscure display at the back of their booth. When we visited the booth, the placards with all of the information were missing from that display (perhaps intentionally), and with all of the overwhelming excitement of the show, we flat out missed it in our initial coverage of the event. Shortly after the event, however, we heard that the light was already in production and getting plenty of use outside of the aquarium hobby. And after about ten months of waiting for the official release of this fixture, Ecoxotic finally listed the fixture on their website, though the delay hasn’t been for a lack of trying. Apparently, they’ve only barely been able to keep the fixture in stock, as it’s a popular choice among public institutions. According to Ecoxotic’s website, the new pendants feature a 120watt multichip LED, an integrated diver, a polished aluminum reflector, and a glass lens. This makes it the largest Photon Cannon in the arsenal, and a great choice for deep aquariums and public exhibits that were previously illuminated by 1,000 watt metal halides. 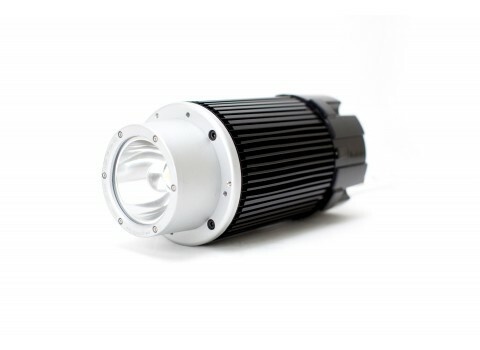 This large Cannon pendant currently only comes in the circular form factor, but to give users options for spreading the powerful beam of light, a trio of lenses (60, 90 and 120 degrees) can replace the stock glass lens. Three models will be available, differing only in the spectrum of the light, and the retail price will be $699. The color options include a 10000K White, 5000K White, and 453nm Blue pendants.